The Wild Child by Mary Jo Putney is a fantastic historical romance. Ms. Putney has delivered a well-written book. I loved the characters, they are amazing. This book did have spots where it dragged a bit, and was a little repetitive on some subjects. Dominic's brother is supposed to marry Lady Merial but sends his twin, Dominick in his place so Merial can get familiar with him. Merial, believed to be mad, and Dominick's story is loaded with drama, humor, action and sizzle. 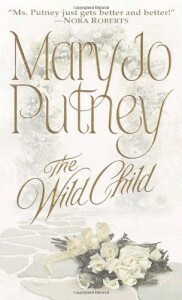 I enjoyed reading Wild Child and look forward to my next book by Mary Jo Putney. Wild Child is book 1 of The Bride Trilogy but can easily be read as a standalone. This is a complete story, not a cliff-hanger.